Great place! Stefan and Robert, as well as the other staff members, give 110% Much appreciated! 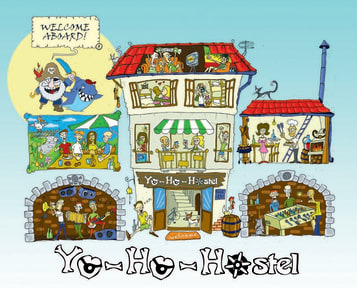 Probably the best hostel in Varna. Great location! Great staff as well. They explain you how to go places and give you a free map. Indoor and outdoor social area. Showers are in the same room with toilets so it’s not the best setting. Overall really good for the price. Nice breakfast too!! Pros - good value and good location for the price. Noisy was not bad. Bunk beds are solid and don’t move when other person moves. Cons - what’s up with the us military guy living off government money just hanging around there. He’s just there to hit on girls. Yuk. Doesn’t work there. Is not a guest. Just a predator. Yuk. Get him out. Cold as f*** wet bathroom floors, hard beds, no space and a not-well coming atmosphere. Arrogant, annoying and not-engaged staff too. Horrible hostel wouldn’t let me dog sleep here! staff was super unfriendly and threatened to throw people out the window if they weren’t quite.